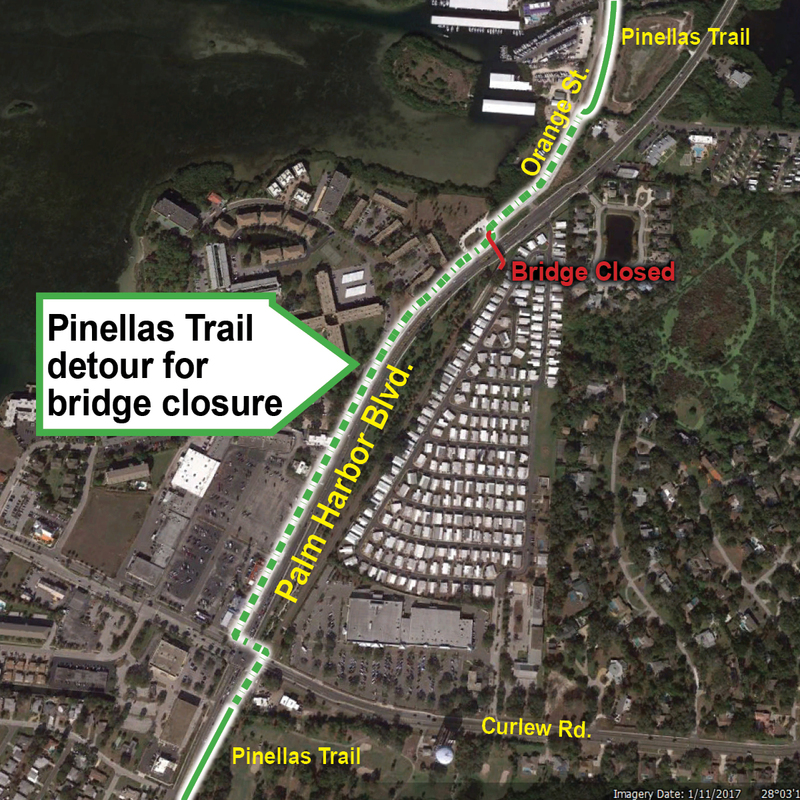 A portion of the Pinellas Trail has been closed for replacement of a pedestrian bridge. DUNEDIN – Pedestrians, cyclists and runners now have a detour to follow that will allow continued use of the Pinellas Trail while a pedestrian bridge is rebuilt. In late September, the Orange Street/Alt. 19 overpass section of the trail closed to allow for a construction project to replace the pedestrian bridge over Alt. 19 between Curlew and Tampa roads. Pinellas County Public Works has partnered with the Florida Department of Transportation to construct a sidewalk connection, creating a detour at Alt. 19 that connects to the Pinellas Trail. Coming from the south: Trail users should cross Curlew Road, then Alt. 19 and use a sidewalk along the west side of Alt. 19 to reconnect with the trail using the new sidewalk connection at Alt. 19 and Orange Street. Coming from the north: Trail users should use the new sidewalk connection at Orange Street to connect to the sidewalk along the west side of Alt. 19. Continue south to reconnect to the trail at the Curlew Road intersection. Additional traffic control features are being evaluated by Pinellas County and FDOT for a long-term detour route while the trail overpass is being reconstructed. For information about the Pinellas Trail, go to pinellascounty.org.